Princecraft’s Maska DLX WS fishing boat is so new that it is being called a 2015½ model and it was even too new to be part of Princecraft’s 2015 fishing boat catalog. But go online to Princecraft’s website and everything you need to know about this newest addition to the DLX series is there. This series comprises an unusual combination of thirteen models from a fourteen foot open tiller model, through side consoles, to a nineteen foot walk-thru, dual console model. 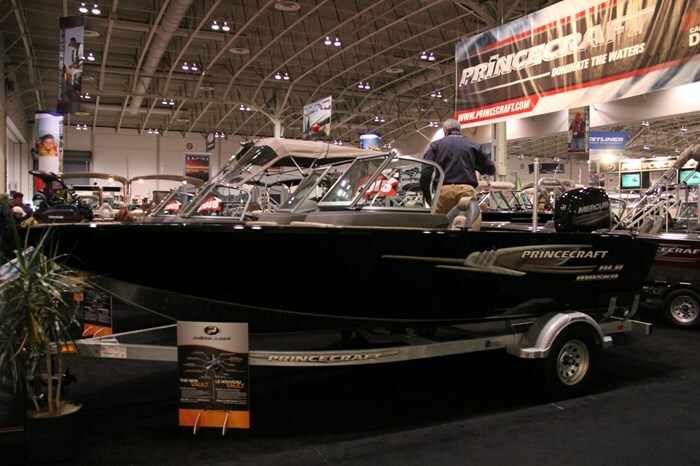 In all, Princecraft offers forty-six models of aluminum fishing boats in ten series for 2015 in fishing, utility, and jon boats ranging from ten to twenty feet plus thirty-four models of pontoon boats in eight series from fifteen to twenty-seven feet plus another six models of Ventura aluminum deck boats from nineteen to twenty-two feet. The Maska DLX WS is ideally suited for the cool early spring and late fall prime fishing seasons in Canada with its tall, full windshield with walk-thru dual console design providing the required weather protection needed. And true to its DLX description, it is loaded with lots of the most desired standard fishing features and can be optionally outfitted with virtually any additional fishing accoutrements you could possibly imagine. Riding on an eighteen foot, one inch center line length on a seven foot, seven inch beam with a maximum depth just short of three feet and with a relatively deep-vee hull design and a maximum horsepower rating of 150, the Maska DLX WS is well suited for big water fishing. 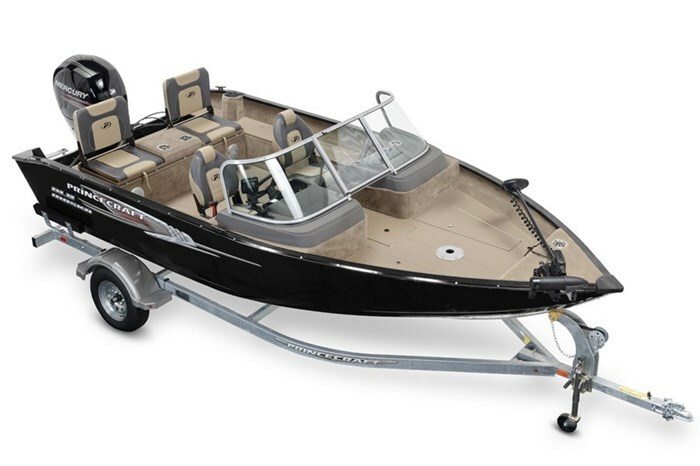 Add to this the twin bottom plating from bow to mid-ship plus at the chines plus built-in rigging tubes from the stern to the console and from the console to the bow, and you just know this machine is meant for serious fishing. The fishing friendly layout of the Maska DLX WS includes bow and stern casting platforms each with a seat base plus four additional seat bases within the cockpit to accept the two folding fishing seats provided. A cockpit-accessible lockable rod storage compartment with organizing tubes for up to nine fishing rods extends under the bow casting platform. An additional rod storage locker suitable for four rods up to eight feet long is found along the port side. Two additional gear storage lockers are located within the bow deck, with additional storage along the cockpit starboard side, within a lockable glove box, and more within the stern casting platform. There is also open storage on the floor beneath both driver and passenger consoles. Within the stern platform is a 44-inch, 20-gallon (77L) SportFlo electric-filled and aerated livewell with overflow plus an anti-spill cover plus filtered inlet protection. The high, three-piece tinted, curved, tempered glass windshield with centre walk-thru is mounted on the raised molded consoles for even extra height for extra protection from weather. The modern looking molded helm includes tachometer, speedometer, voltmeter, trim and fuel gauges. Your choice of three Mercury 4 Stroke outboards of 90, 115, or 150 horsepower is available to power the Maska DLX WS. Other notable standard equipment includes high gloss High Solids exterior urethane paint in two colour choices of red or black. Vinyl flooring is standard. A carpeted bow mounting trolling motor pad with 12 or 24-volt trolling motor plug, receptacle, and wiring harness is standard as is a transducer mounting plate and the PrinceTrak extrusion for onboard accessory attachment. A galvanized bunk trailer is also provided. The list of options is huge with general items such as tilt and hydraulic steering, a slider for the captain’s chair, two choices of AM/FM Bluetooth compatible stereos, Mercury SmartCraft gauges, and many upgraded seating, trailer, and canvas options including up to a full stand-up enclosure. Also available for cruising or watersports enthusiasts are a stern boarding ladder, removable ski pylon, bow rider seat cushions, and a stern casting platform overlay consisting of a pair of flip-up jump seats and built-in cupholders. For options specific to fishing, choose from a wide variety of Lowrance or Humminbird depth/fishfinders/GPS, a Mercury 9.9 outboard “kicker” motor with remote control and interconnected steering, several choices of MotorGuide or Minn Kota trolling motors with or without wireless controls and/or iPilot, a one or two-bank battery charger, various PrinceTrak accessories, and a livewell minnow bucket. Many fun decisions on options will be made to build the Maska DLX WS just the way you want it but the end result will be pleasing, rewarding, and ever so fishing-friendly.